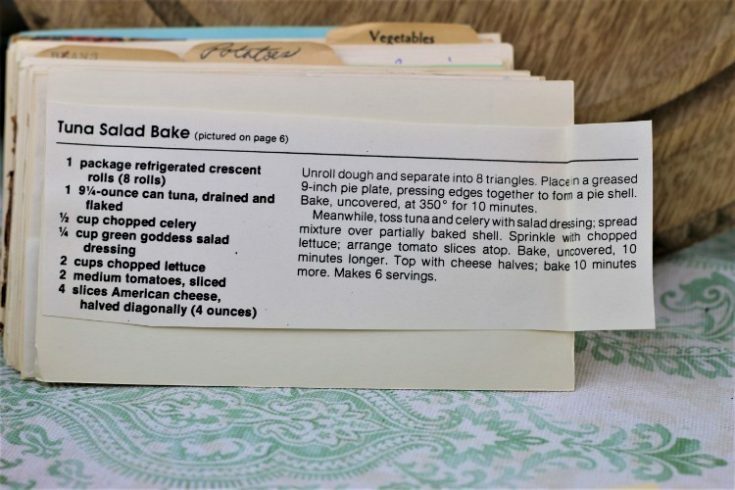 Front of the recipe card for Tuna Salad Bake. 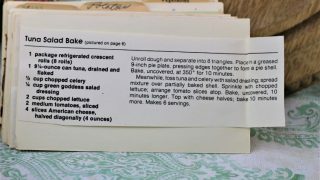 There are lots of fun recipes to read in the box this recipe for Tuna Salad Bake was with. Use the links below to view other recipes similar to this Tuna Salad Bake recipe. If you make this Tuna Salad Bake recipe, please share your photos and comments below! Unroll dough and separate into 8 triangles. Place in a greased 9-inch pie plate, pressing edges together to form a pie shell. Bake, uncovered, at 350° for 10 minutes. Meanwhile, toss tuna and celery with salad dressing; spread mixture over partially baked shell. Sprinkle with chopped lettuce; arrange tomato slices atop. Bake, uncovered, 10 minutes longer. Top with cheese halves; bake 10 minutes more.